Peaches and rhubarb are only the beginning of peaches-plus combos I have come to love over the last few years; just this summer I’ve also experimented with peach-raspberry tarte tatin, peach-blackberry crumble and, over Christmas, peach-redcurrant jam. I used what I had in the fruit bowl to make this when I realized I had enthusiastically overbought redcurrants, forgetting that no one but me likes them. This batch was probably about 600 g/20 oz fruit, roughly 65/35 peaches/redcurrants. I added in half the weight of sugar – some of it from my stash of citrus sugar. It wasn’t a long cooking job, as it was such a small amount; I followed my usual method and I got about 2 jars out of it – one 360 g/12 oz size, and one 240 g/8 oz. I didn’t bother with canning for only 2 jars, just stashed them in the fridge for easy access for breakfast toast, yogurt-and-granola, etc. 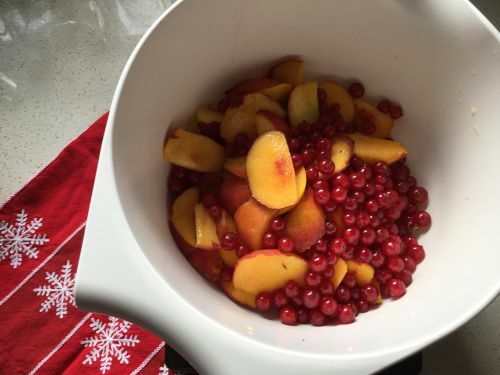 The peaches and redcurrants make for a great sweet-tart combo – worth a try if you can a) get your hands on some redcurrants (this batch is the only time I’ve seen them for sale anywhere in Australia in the past 6 years) and b) don’t immediately eat them all yourself.